Both these fruit sellers used to offer fruits to monks who are going on almsround. One of them offer good fruits and one give fruits that are almost rotting and could not be sold. It so happened that the lady who gave the rotting fruits lost her consciousness suddenly one day and was rushed to the hospital. The lady’s spirit left her body and was travelling around. She then got hungry and saw some fruits. She wanted to take the fruits and eat it but saw that the fruits are rotting with worms coming out of it. She realized that the fruits were not edible. She looked around and saw some very good fruits and wanted to take them. a person wearing white told her that those nice fruits are not for her. She refused to listen and tried to take it- and the moment she hold the fruits, she felt her hand being burned. She quickly put the fruits back. The person in white repeated again that those fruits are not for her. She refused to believe and so she took the fruits, put to her mouth and felt the fruits burned her mouth. She then realized instinctively that the fruits were meant for her friend who had always been giving good fruits to the monks. While all she deserved are rotted fruits because that’s what she used to give. She thought to herself, that if she ever had another chance to go back and do it all over again, she will give the best fruits she had. Suddenly, she woke up. She recalled what that had happened with clarity and from then on, she always ensure she gives good things. She said that initially, she had started to give to the monks in the first place because she had been envious of the other fruit seller and refused to lose out. She now realized the error of her ways and even told the other fruit seller that there’s good merits waiting for her since she had always been giving good fruits to monks. The good fruit seller’s friend is one of Khun Mae’s follower and so the follower relayed this story to Khun Mere. 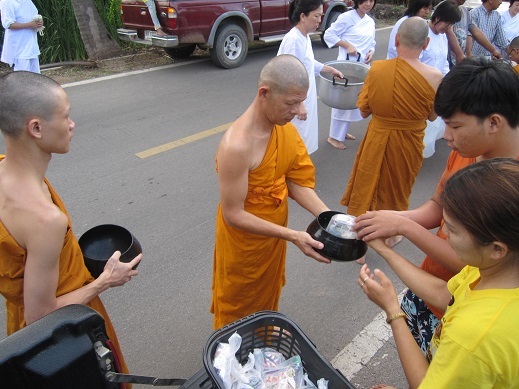 Therefore, Khun Mae advised that if we give (dana) good things, we get good things in return. If we dana rotten things, we get rotten things in return.